If your ancestors are from the Val di Non as are the Genetti family, your family’s native tongue is a dialect called “Nones”. An ancient Rhaeto-Romance language, Nones is now considered an endangered language with only about 40,000 people in the Non Valley of Trentino who can still speak the dialect. Today I stumbled upon a surprising YouTube link by the Endangered Language Alliance. It was a five part video series of three members of the Flaim family telling of their life as Tyrolean immigrants in New York City. I recognized the family surname right away, as we have several Flaim women who married into the Genetti family and are listed on our family tree. Also the Flaim family originated in the village of Revo located near Castelfondo in the Val di Non. As it happens, one of my great-grandmothers was Catterina Lucia Fellin (married to Giovanni Battista Marchetti). Catterina’s family was also from Revo. So I was absolutely delighted to view these video clips. Giovanna Flaim speaks of her family in her native dialect, although I’m certain that Italian was also mixed in with the conversation. The old photos used to illustrate the videos are marvelous. It was well worth an hour of time listening to their words, beautifully melodic and foreign, awakening my ear to the language of my great-grandparents. To view all of the Flaim family clips on YouTube, click here! You also may be interested in a short webpage by Carol E. Genetti, a Professor in the Department of Linguistics and Dean of the Graduate Division at UC Santa Barara (and yes Carol is a descendant of the Genetti family who originally immigrated to Wyoming from Castelfondo). To read more of Carol Genetti’s experience with the Nones dialect, click here. And finally, you can view an interesting section on the website maintained by “Filo: A Quarterly Magazine for Tyrolean Americans” describing the Nones dialect, written by Lou Brunelli, Editor of this enterprising publication. Lou grew up hearing dialect spoken in his home. He includes several word lists of dialect along with their Italian and English translations, plus a history of the Nones language. For this link at Filo, click here. Wishing all of my Genetti kin a happy and prosperous New Year! Should You Write an Autobiography? 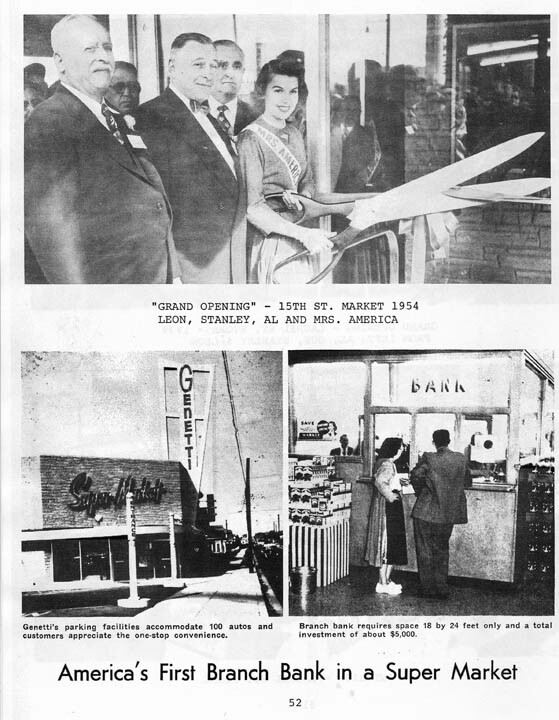 A page from Stanley Genetti’s autobiography. Have you ever thought of recording your life for future generations? I’ll bet your grandchildren and great-grandchildren would treasure a biography containing remembrances and details about the times in which you lived. And if your family is like ours, with a long and detailed history, an autobiography becomes part of the family’s ancestral legacy. You’re probably thinking “why would someone want to read about me?” So many of us believe that our everyday lives are not worth writing about. But one hundred years from now, I can assure you, ordinary lives will seem quite extraordinary to future generations. Our family stories and photos, memories, details about our home and the town where we lived, reminiscences of how we met our spouse, what we did for a living, our children’s escapades, those folksy colloquialisms that pepper our speech – all of the small details of our “ordinary” lives will be cherished by future descendants searching for their family roots. I know of two biographies written by members of the Genetti family. One by Stanley Genetti of Pennsylvania and the other by Herman Genetti of Wyoming, with the intriguing title of “Herman’s Howlings: A Personal History of Southwestern Wyoming”. Both are fascinating first-hand accounts of life in America for Tyrolean immigrants during the 1900’s. Sprinkled with family stories, regional history and ancestral details, they make for very interesting reading! Unfortunately both memoirs are self-published and hard to come by. Having been produced in a limited number and usually only in the possession of direct family descendants, it is nearly impossible to obtain a copy of either Stanley’s or Herman’s autobiography. Fortunately I have been able to locate both books. Several years ago, a copy of Stanley’s book was given to me by one of his grandchildren. I have read it many times, gleaning a good bit of genealogical information from Stan Genetti’s stories (FYI – Stanley was my grand uncle or in other terms, my grandfather’s brother). Recently I was given a copy of Herman’s book. I had been looking for this volume for some time and had found only obscure mention of it online. Unbelievably, on a recent trip to Italy I met with a friend who is a local historian (and not from the Genetti family). He handed me Herman’s book and asked if I had ever heard of him. Apparently a copy of the original was given to my friend, possibly through someone in the Genetti family. I was amazed that at some point Herman’s book had made a long trip from Wyoming to Castelfondo, Italy and now would be returning to the United States via a distant cousin (me!). I gladly accepted the thick Xeroxed spiral-bound copy, tucked it away in my suitcase and happily returned to Santa Fe with my family treasure. I’m currently enjoying perusing “Herman’s Howlings”, sifting through the pages for genealogy info to include on our online family tree. My hope is to one day include both of these books as free PDF downloads on The Genetti Family Genealogy Project website, of course with the permission of their descendants. If you are a direct descendant of Stanley Genetti or Herman Genetti and would like to make their autobiographies available for the rest of the family to read, please contact me at info.genetti.family(at)gmail.com. Mille grazie! a spectacular New Year filled with life’s treasures! I received a wonderful email from Gary Genetti today. Gary is a master glass artist with work in many private and museum collections. 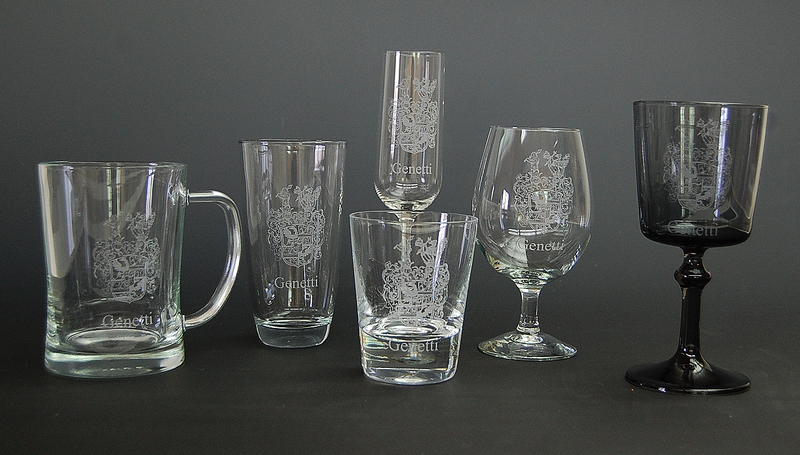 He has generously offered to etch glassware with the Genetti Coat-of-Arms for family members at a discounted price. I’ve created a separate page in our Genetti Shop just for Gary. Please stop by to see more examples of Genetti glassware. Click here to visit Gary’s page. I’ve also spoken with Gary about offering more of his glass pieces in our online shop. I’m very excited about this! It would be fantastic to showcase the artistic talents of our family members. I look forward to working with Gary in 2015 on this project. To see more of Gary’s exquisite glass art, visit http://genettiglass.com. 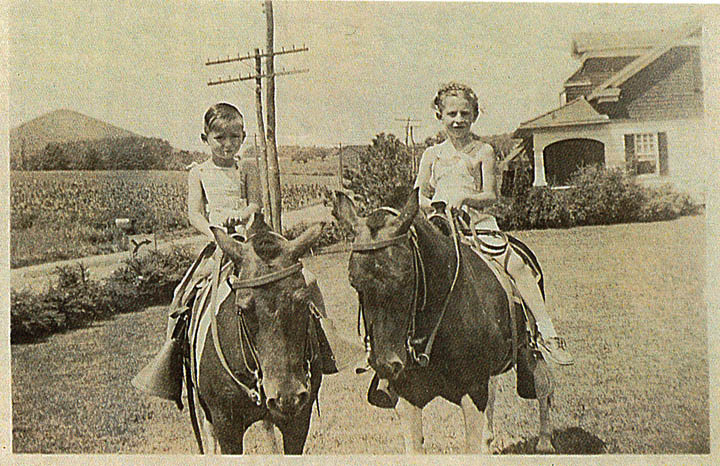 First cousins, Bill Genetti and Jean Branz Daly, about 1940. In previous blog posts you’ve heard me talk about 2nd cousins, 8th cousins, cousins that are once or twice removed, and so on. What does this genealogy jargon mean and how do I figure out the relationship between all of those cousins? Surprisingly, we all have a multitude of distant cousins. If you take an autosomal DNA test (a combination of both parent’s DNA) through Ancestry.com or Family Tree DNA, you will be matched up with others who have snippets of the same DNA. The more pieces of their DNA that match, the higher the likelihood that they are a close relative of yours. A first cousin may match up to 25% of your DNA. A sibling should match close to 50%. The more distant the cousin, the less DNA will match. We’ll save the DNA discussion for another time, since it is rather complicated. But just keep this info in mind as we discuss different degrees of cousins. Lidia Genetti (center) with two daughters, Giovanna and Laura. Laura’s young daughter Viola is also in the photo. Photographed 2014. To determine a cousin relationship you first need to find your Closest Common Relative or CCR. You then count each generation away from this CCR to determine the cousin level. – Siblings or half-siblings: you share a parent. – 1st cousins: you share a grandparent and are from the same generation. – 2nd cousins: you share a great-grandparent and are from the same generation. – 3rd cousins: you share a 2nd great-grandparent and are from the same generation. – 4th cousins: you share a 3rd great-grandparent and are from the same generation. 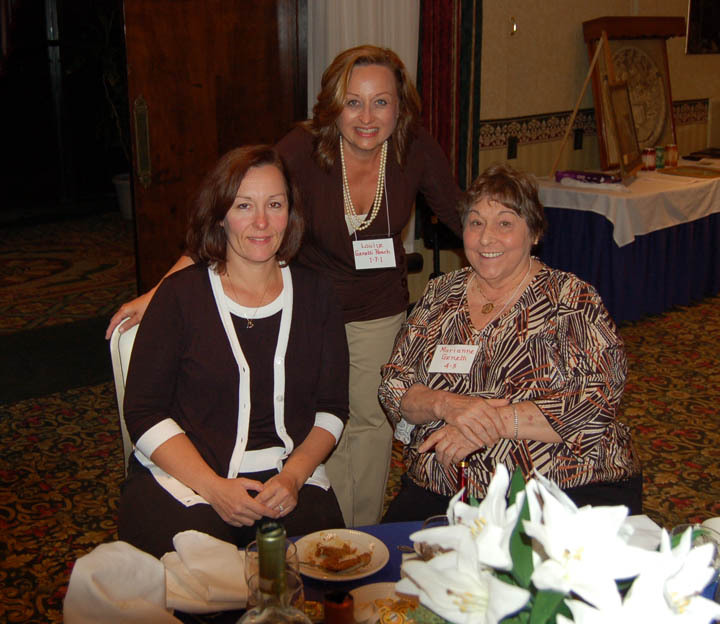 At Genetti reunion 2010, Valeria Genetti Bozek, Louise Genetti Roach and Marianne Genetti. And it continues from there. I have traced some people to the level of 8th cousins! Usually I can figure out the relationships up to 4th cousins in my head. For really distant cousins (5th and beyond) I have to look at our family tree and physically count each generation from our Closest Common Relative. The further back in time that the CCR lived, the more distant the cousin. After discovering several 8th cousins, I found our CCR was born around the mid-1600’s. Now comes the difficult part of the equation – what does “once removed mean”? This means that you share a CCR, but are from different generations. For example: the child of my first cousin would be my “first cousin, once removed”. Or in other terms, my grandparent(s) and their great-grandparent(s) are the same person – this is our shared CCR. A first cousin, twice removed would be the grandchild of my first cousin. Yeah, I know, it sounds complicated! But once you get the hang of it, the system really isn’t difficult to understand. The cousin relationship is one of the most important tools you have when researching genealogy to help discover family connections. And in answer to several people who have written me – sorry, a second cousin is not the same as a first cousin, once removed. Second cousins share a great-grandparent. First cousins, once removed share a grandparent/great-grandparent (same person). Let’s talk about the photos that accompany this post. The first image is of first cousins Bill Genetti and Jean Branz Daly, they share a set of grandparents and are also my father’s first cousins. My relationship to both Bill and Jean is first cousin, once removed – we have the same Closest Common Relatives, but I am from the next generation – or one generation removed. 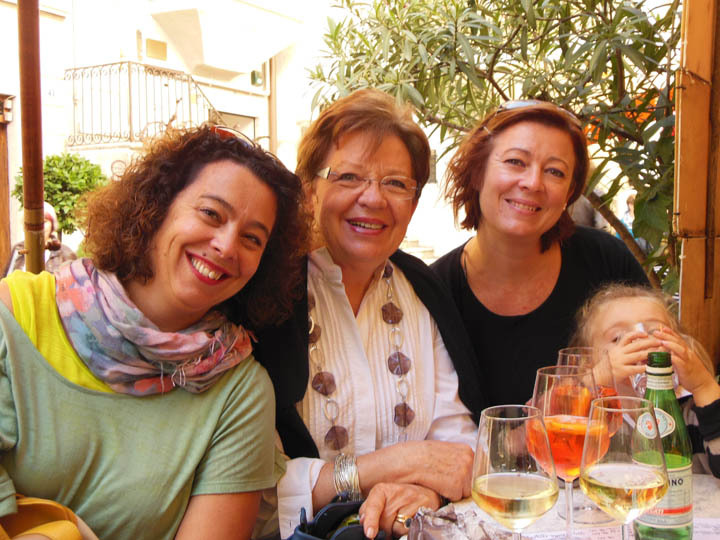 The second photo shows Lidia Genetti from Italy with her two daughters and a granddaughter. Lidia’s 2nd great-grandparents and my 3rd great-grandparents are the same, Antonio and Veronica Genetti, (Antonio was born in 1789). That makes me Lidia’s 3rd cousin, once removed. Since I am from the same generation as Lidia’s daughters, I am their 4th cousin (we share the same 3rd great-grandparents, Antonio and Veronica). Laura’s daughter is my 4th cousin, once removed because she is from the next generation. Just one more fact to make your head spin – every person has sixty-four 4th great-grandparents or 32 sets! Yep, that’s a whole lot of great-grandparents! If each family had on average of three surviving children, that makes 96 fifth cousins. If you multiply that same equation out over five more generations, you end up with an average of 23,328 cousins! 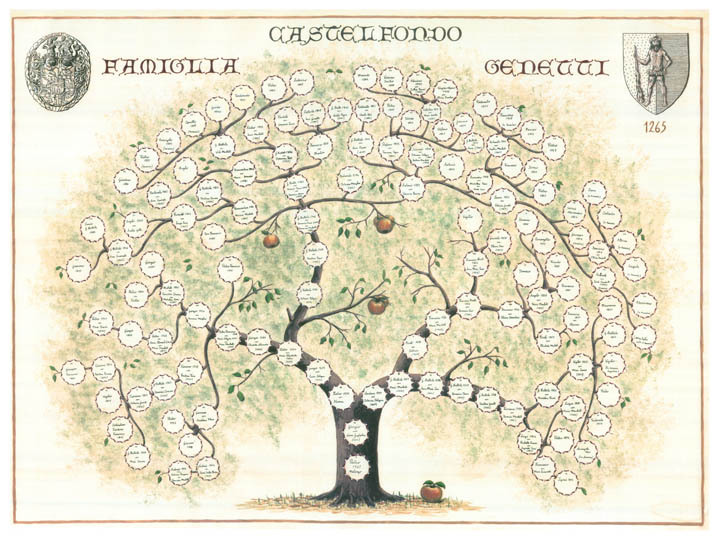 At last count my great-grandparents, Damiano and Oliva Genetti, have five generations of descendants – over 250 people! Now you understand why you have so many cousins! Just a quick peek at some of the gifts I’m giving this year! All from the Genetti Shop! 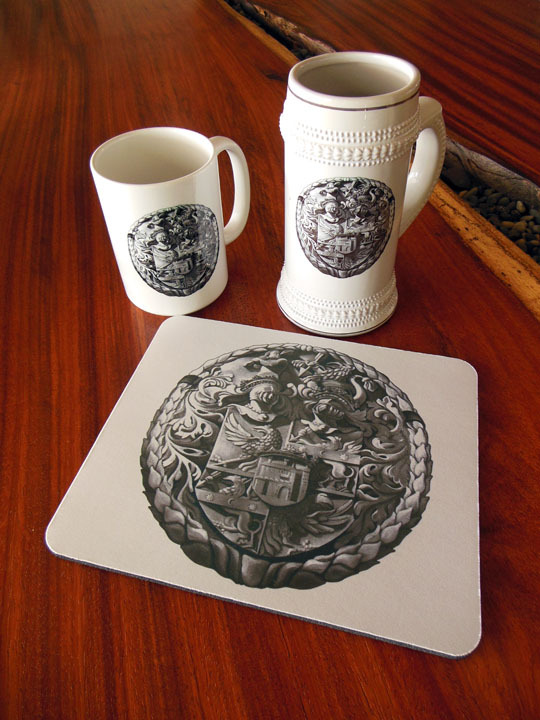 Pictured are coffee mug, beer stein and mouse pad – personalized with the Genetti Coat-of-Arms. All of these products were produced by Cafe Press and are available to order online through our website. Pretty cool, huh? Visit the Genetti Shop for other gift ideas. 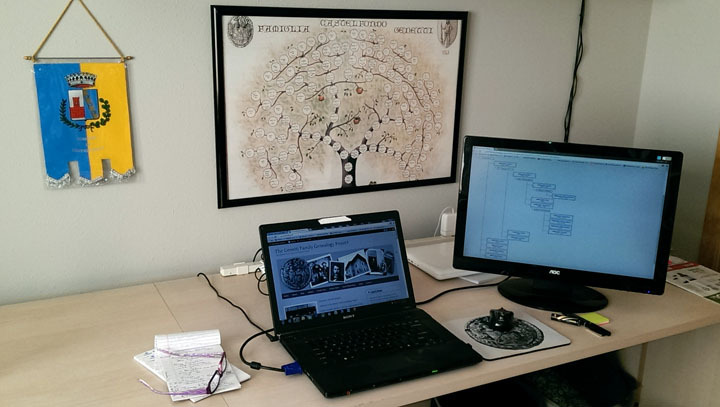 One of the best things about being a family genealogist is helping others find their roots. About once a month I receive a request from someone who has searched online for family information and stumbled upon the Genetti Family Genealogy Project. Often the only connection they have with their past are their grandparents. So this is where we begin the search, hoping that my library of family ancestry will yield clues to their heritage. Usually it takes about a week to research and compile the information, always with surprising results! Two weeks ago I received an email from Andrew. His mother was a Genetti and he was hoping I could trace his family lineage. When I read that his family had settled in Illinois, I knew exactly what branch of the tree to begin our search. You see I’ve found that different family groups (or branches) from our tree, immigrated to specific locations in North and South America. 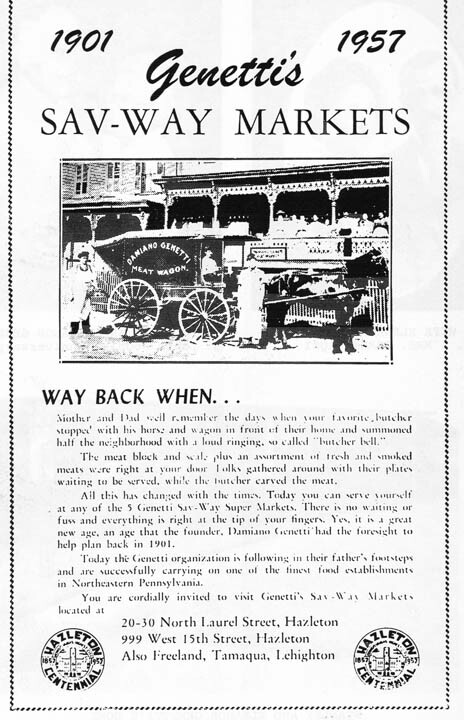 They usually stayed together as an extended family and you can still find them in that location today. For example, my family settled in Pennsylvania. Others went to California, South Dakota, Michigan, Utah, Colorado and even Argentina. Andrew’s family was all in the Illinois/Missouri area. – We added two more generations to Andrew’s original line, extending four generations past the last ancestor noted on the family tree. 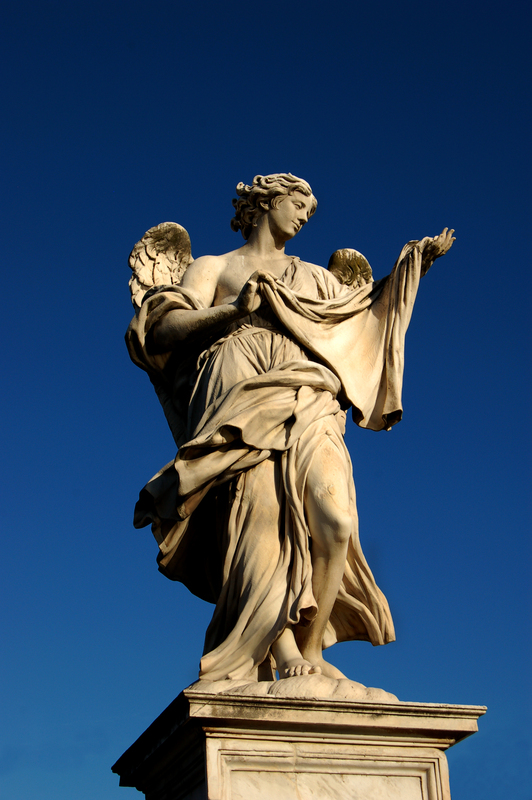 – Twelve new names were added to our online family tree. – I am related twice to Andrew: My 2nd great-grandfather and Andrew’s 3rd great-grandmother were first cousins. That makes Andrew and me 4th cousins, once removed. And through Andrew’s 3rd great-grandfather, I am Andrew’s 8th cousin, once removed with our closest share relative being Pietro Genetti born in 1650. Plus there were other surprises hiding within this genealogy that I have yet to figure out. But I’m sure it will be quite the story when I do! If there is anything I’ve learned from the Genetti clan, it’s that we are always full of surprises! In my next blog post I’ll explain how I determine the different levels of cousins (2nd, 3rd, etc.) and what does it mean to be a cousin “once removed”. So stay tune for more interesting genealogy jargon. Mug with Genetti Coat-of-Arms. Also available as a stein and stainless steel travel mug. With Christmas fast approaching, remember to shop for personal family gifts at the Genetti Shop! 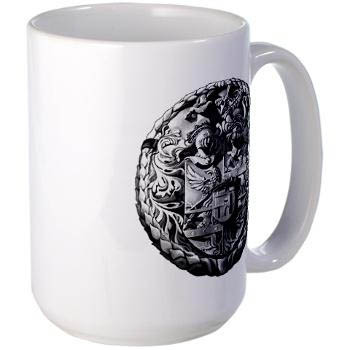 Here you’ll find mugs, T-shirts and mousepads with the Genetti family coat-of-arms; books about our Tyrolean culture; fine art prints of the original family tree and much more. It’s not too late – order today and surprise you’re family with unique gifts that celebrate our family ancestry. Who or Where is Melango? 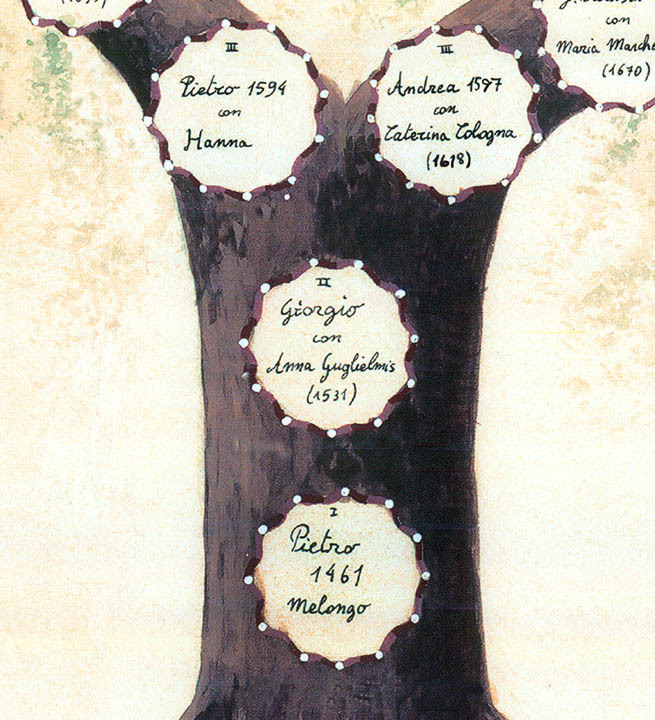 Base of the original family tree. Since I began researching our family genealogy, I’ve had a question about “Melango”. The first time I saw this word was on the Genetti Family Tree under Pietro Genetti born in 1461. Along with Pietro’s name is the word “Melango”. At first I thought this was Pietro’s wife, as this is the format for everyone else on the tree – husband’s name first, wife’s name listed below his. But when I began researching baptismal records, I found that Melango was recorded as a place of origin. The record pictured below states that a son was born to Pietro Genet (oldest form of our name) of Melango on the 12th of February, 1568. He was baptized Andrea. 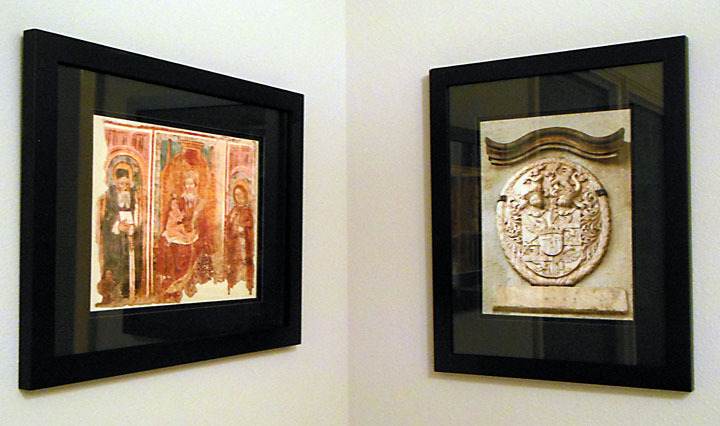 The godmother to the child was the wife of Antoni Lorenecto (maybe a form of the name Lorenzetti) also of Melango. Obviously, Melango was a place. In almost all baptismal records of the time, the father’s village of origin is recorded, as a means of identification. For example, if you have five men named Pietro Genet born in the same region, you can tell them apart by their town. Baptismal record from St. Nicolo Church, 1568. Since the origin of the Genetti Family was supposedly the village of Castelfondo, I was confused. Researching further, I found that baptismal records through the end of the 1500’s clearly state that our branch of the family were all from Melango. About 1625, the records change, stating that our ancestors were “di Castelfondo” or “of Castelfondo”. After searching for Melango on historical maps, Google, Wikipedia and even consulting with a local historian, I had no clear-cut answers. It seemed that Melango had been lost somewhere in time! 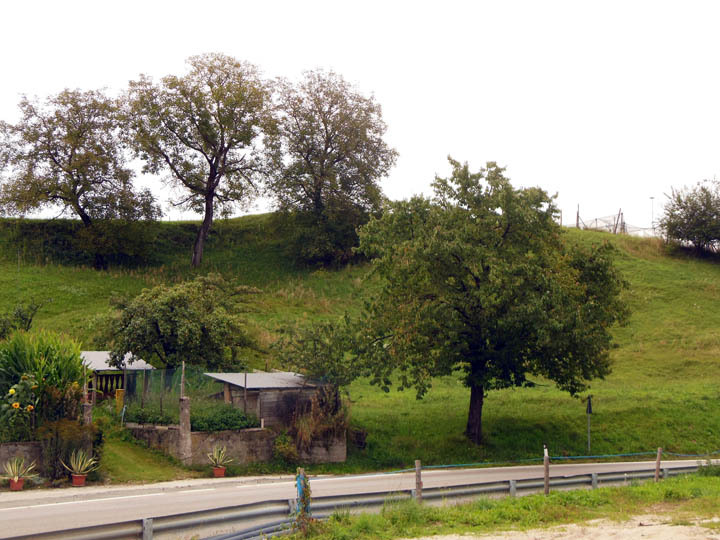 Possible location of Melango – hill near Castelfondo. On my first visit to Castelfondo in 2011, I met an older gentleman who had known my great-grandfather in the 1930’s and 40’s. Since Andrea spoke fluent English, he escorted me around the village, explaining various sites. When I approached the question of Melango, Andrea was also unsure. He and our historian friend, Marco, thought that it was a name for the general area of Castelfondo, but it was no longer used. When I returned to the village this past September, Andrea had a surprise for me. He brought me to a hill right off the road leading into Castelfondo. The site was located between the village and Castello di Castelfondo, an ancient castle with origins dating back to the 11th century. “This is Melango,” he told me. We were standing on a high mound, covered with grass and partially planted with apple trees and grape vines. From the top of the hill we could see the gables of Castello di Castelfondo, peaking out from the forest further down the highway. Again, I was confused. Andrea explained. 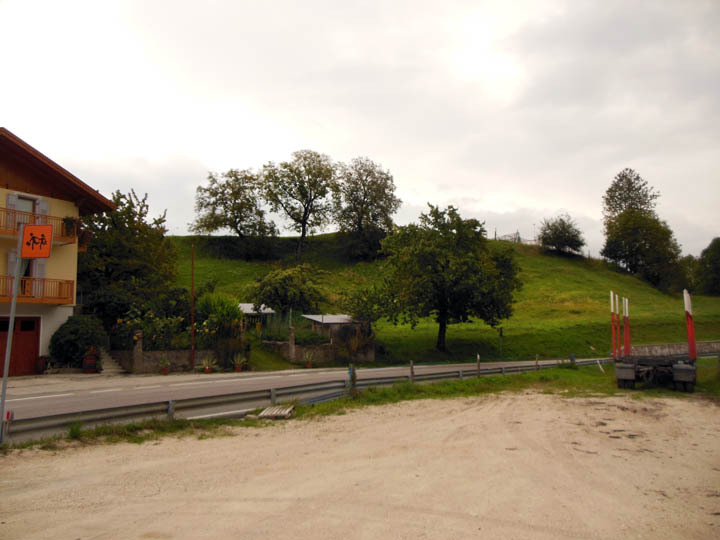 After speaking to a number of people, he had learned that Melango had indeed been a village located closer to the castle than the current town of Castelfondo. He was told at some point in history, there was a landslide that covered the village of Melango. And this hill was the remains of Melango – we were standing on top of an archaeological site! Apparently everyone who had survived moved up the road to Castelfondo or to the other surrounding hamlets. I asked if he knew the date of the landslide. No, he did not. Judging from the Castelfondo baptismal records I had spent months scouring over, Melango as a location seemed to fall out of use by around 1600. So if a slide had occurred, my guess was that it happened a generation before, around 1575. The rooftops of Castello di Castelfondo as seen from the hill where Melango may have been located. Arriving home, I tried researching Melango again. This time I was lucky! I found it mentioned on the Commune di Castelfondo webpage under the section titled: “Il paese”. After running the page through Google translator, I had a rough English translation. It seems the name “Castelfondo” designated a parish region composed of the communities of Melango, Raina and Dovena. I was familiar with Raina and Dovena, as they are hamlets bordering Castelfondo still in existence today – almost like Gothic suburbs. So that meant Melango had also bordered the village at one time. From the website translation, the description of Melango’s location matched the hill that Andrea had taken me to. 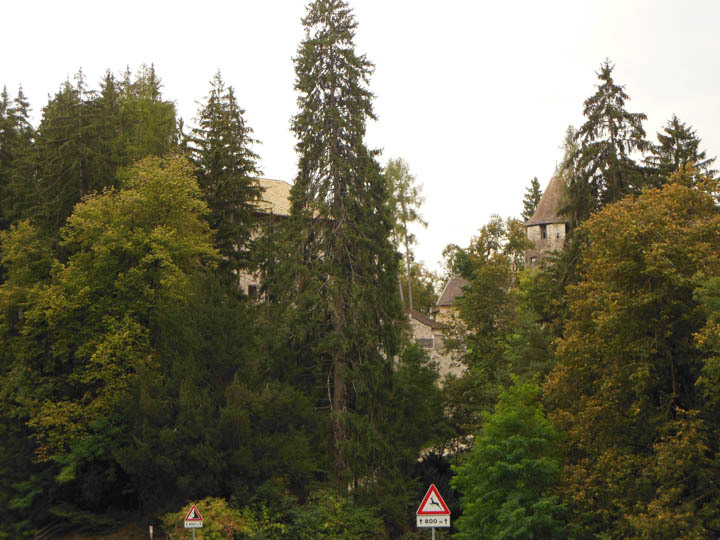 According to the historian, Carl Ausserer (“Archive Trentino” published 1900, historical literature quoted on the Castelfondo website), Melango was the original location of the first fortification and settlement in the region. It pre-dated Castello di Castelfondo! Numerous archaeological finds from the site confirm that there were originally Roman and pre-Roman settlements on this location. The text also states that apparently over time the community of Melango disappeared due to abandonment or depopulation as a result of plague epidemics. The name was no longer used and the entire region became known as Castelfondo. So now I had two stories about Melango, both fascinating! The village certainly did exist, but it’s true history pre-dates written records. Now I don’t know how valid either story is, but a few of the puzzle pieces are following into place. In conclusion, it appears that our true family origin is from a village that no longer exists! However, this also could mean that the Genetti family is much older than the first date on our family tree of “1461”. What do you think? I have another date that I’m researching of 1265 concerning the origin of our family. But hey, that’s another story! Special Note: here is a link to an excellent photograph by Enrico Marchetti, showing Castello di Castelfondo in the forground and the village of Castelfondo in the background. Click here!